Unlike Friday night, the Yankees showed no sign of rust after not playing all week, as they clobbered five long balls en route to an 8-3 win over the Royals. With the win, the Yanks (29-13) are once again tied for first place in the AL East with the Red Sox (31-15). 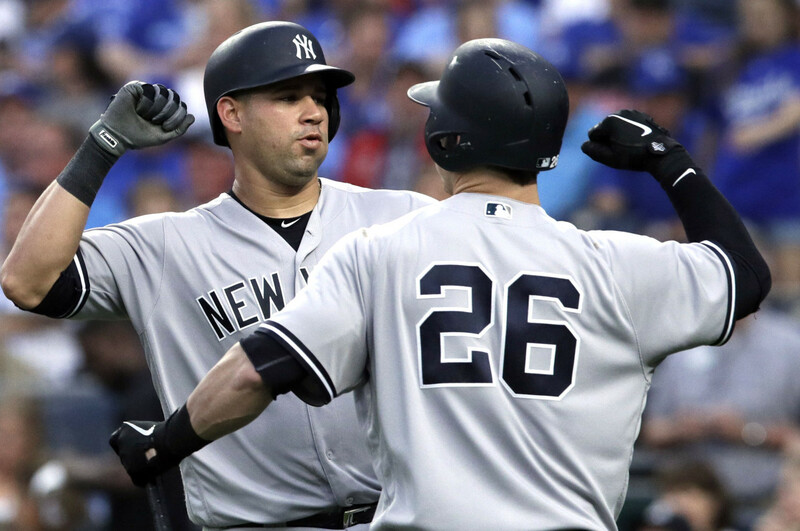 The Yanks came out swinging early against Royals southpaw Danny Duffy, as a Hicks single and a Sanchez RBI double led to a 1-0 lead in the first inning. After a couple of solid innings from Luis Severino, Hicks led off the third inning by drilling a ball into the right field corner. The ball ricocheted off the wall away from right fielder Jorge Soler, and Hicks sped around the bases for his second inside-the-park homer of the season, and his fourth homer of the year. With this, he also became only the second Yankee in franchise history with multiple inside-the-parkers in a single season, joining Mickey Mantle in 1958. The Royals fought back in the bottom of the third, scoring two runs on an RBI double by Ryan Goins and an RBI single by Soler. 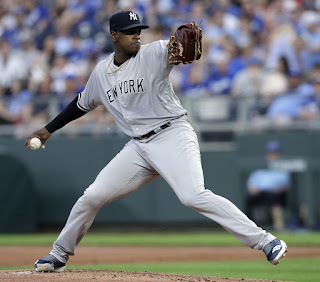 Severino was able to limit the damage, however, striking out Sal Perez and Whit Merrifield to end the inning. Clint Frazier led off the fourth inning with a walk, and Torreyes singled. Gleyber Torres then destroyed a Duffy off-speed pitch, crushing it 407 feet into the left field bleachers to give the Yanks a 5-2 lead. It was his fourth homer of the year. The Royals would not go away though. They brought in another run in the bottom of the fifth inning on an RBI single by Mike Moustakas, and would have gotten a second if it hadn’t been for a sparkling defensive play by the Yanks. Perez doubled into left center, and Stanton fielded the ball and threw it offline to the cutoff man Torreyes. Toe then made an off-balance through home, and Sanchez made a beautiful pick and tag to nab Moustakas at the plate to end the inning. The play was challenged, but the call was upheld. At the end of five, the Yanks led 5-3. Severino’s night ended after six innings, and after it was all said and done, he did not have a terrible start. His final line of 6 IP, 3 R, 8 H, 2 BB, 6 K is not too bad, and he fought all night, limiting a lot of the damage the Royals could have done. Gary Sanchez joined the homer parade in the seventh inning, crushing a Burch Smith pitch over the left field wall for his eleventh homer of the season. The Yanks had a chance to score another run in the seventh, but Andujar was thrown out at the plate trying to score from first on a Clint Frazier double. After seven, the Yanks had a 6-3 lead. Chad Green and Dellin Betances both pitched solid innings of relief, and the Yanks put the finishing touches on the win in the ninth. Stanton and Sanchez destroyed a couple of Blaine Boyer pitches, drilling back-to-back homers to give the Yanks an 8-3 lead. The weirdest part of the inning? The hardest hit ball was a groundout by Aaron Judge, instead of either of the two homers. Chapman closed the door in the ninth, highlighted by Sanchez nabbing Hunter Dozier trying to move to second on a wild pitch. Dozier slightly came off the bag on his slide, and Torres kept the tag on him. The play was reviewed, and Dozier was called out for the second out of the inning. Abraham Almonte grounded out to shortstop to end the game.